Hello beauties!! Summers are here in full swing and so is sun damage, dirt and pollution. During summers, the exposed areas of our body bear the brunt. Since I commute to office and back using public transport my skin is going through a tough time nowadays. Exfoliation comes to my rescue to deeply cleanse the skin from within. I was recently sent Creamy Sugar Scrub for reviewing by Mrs Harini Sivakumar who's the brains behind the Gurugram (Gurgaon) based handmade bath and body treats brand Soapworks. Since I'm a sucker for handmade body scrubs/polishes, I jumped at the opportunity. To know about my experience, keep reading. Indulge in natural, ethical body care; pure luxury for your skin! Skin and body care shouldn't be a chore. It should be a moment of indulgence in our otherwise crazy days. And that indulgence shouldn't come with any worries about what you're using. With soapworks soaps, you can be confident that what your putting on your skin is good and safe for your skin. Say goodbye to dull and dry skin with this very gentle exfoliating body scrub. It contains sugar to exfoliate while moisturizing with our unique combination of creamy shea butter, olive oil, sweet almond oil and Apricot Kernel oil. We have formulated this scrub to be a creamy consistency without messy excess oil floating to the top. No need to stir or shake prior to use! Simply massage into wet skin after using your usual soap and rinse. Your skin will feel like silk. Follow with our lotion bar of your choice for complete moisturizing. Scented with strawberry cream and feels really smooth on skin.. this creamy scrub in short is a lotion, soap and a scrub.. 3 in 1 formula. Ingredients: Beeswax, E-wax, Shea butter, Sweet almond oil, Apricot Kernel oil, Olive oil, Organic sugar and Strawberry cream fragrance oil. Packaging: The scrub comes in a sturdy brown coloured plastic container with a black lid and it looks quite regal and reminds me of packaging of this particular range from The Body Shop. I do wish the jar had an inner disc or a foil to prevent the oils from leaking because when I had received the product the oils had leaked a little bit. Details like price, shelf life and date of mfg are missing from the label. Soapworks Handmade & Natural Creamy Sugar Scrub is baby pink in colour with sugar granules suspended in a base of skin loving oils. The scrub has a thick gooey paste like consistency and smells absolutely divine of Strawberry Creme. It truly feels like a luxurious product since the quality of the product is very good and it's cruelty free, devoid of harsh chemicals. I use the scrub once a week and use a clean and dry spatula to scoop out desired product and massage it it gently on damp skin. Since the scrub has slightly large sugar granules, it falls to the floor and you are left with less granules which does provide gentle exfoliation, also it being an emulsified sugar scrub the scrub turns into a creamy lotion upon massage and you need to rinse a couple of times to remove the scrub completely. Upon rinsing, the dead skin cells do get removed effectively but if you prefer your body scrubs to a bit on the abrasive side like me then you might be in for a slight disappointment as this scrub is super gentle on the skin. The scrub is loaded with skin loving oils like sweet almond, olive, apricot kernel hence it causes no dryness and instead moisturises the skin so you may skip moisturisation post bath in summers. The scrub softens the skin and brightens the skin tone as well. The scrub is suitable for all skin types including sensitive types. 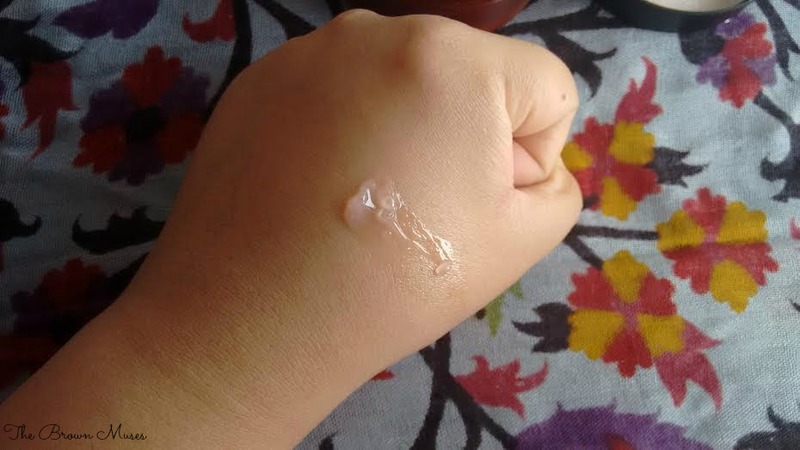 Surprisingly, the divine strawberry cream fragrance stays put on the skin for an hour or so before completely fading and as remarked earlier, I am in love with it's delicate fragrance which makes one feel like they are using a high end product. 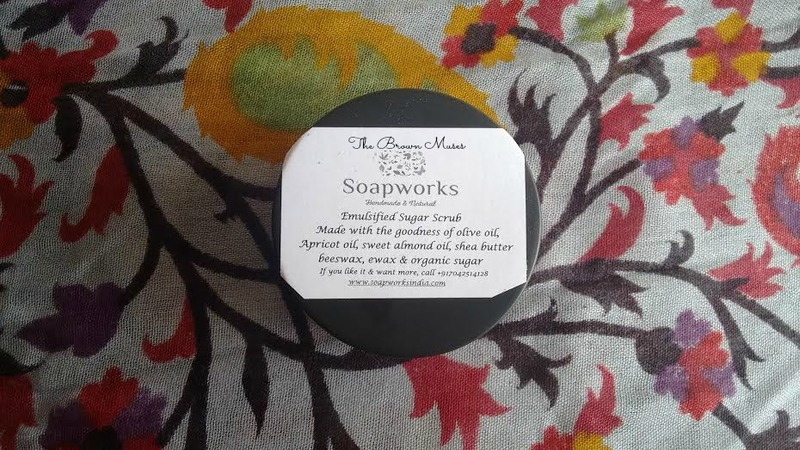 To conclude, Soapworks Handmade & Natural Creamy Sugar Scrub is a decent body scrub to remove dead skin, grime off the skin without stripping it off it's natural oils. Will I recommend: Of course I will! :) If you are looking for a gentle scrub which would do it's job and is safe to use frequently then go for it. Contains a blend of skin loving oils like olive, sweet almond etc. Sturdy packaging but not leak proof. Smells divine! I love love love it's delicate fragrance. It feels like a high end product. Removes dead skin cells and cleanses the skin. 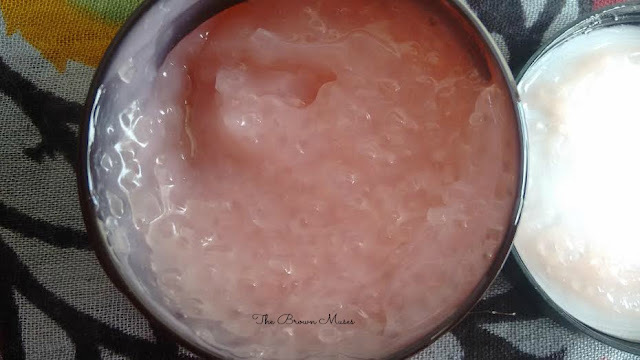 Sensitive skinned beauties are in for a bonanza as this scrub is very very mild. Does not strip the skin off it's natural oils. Softens the skin and brightens the skin tone. Availability - Not a con for me as I do not mind purchasing online. Wish the sugar granules were a bit finer as it would have enhanced the usage experience as I prefer my body scrubs to be a bit on the abrasive side. Disclosure: This product is a PR sample but the views and opinions expressed hereby are strictly unbiased, based on my personal experience.